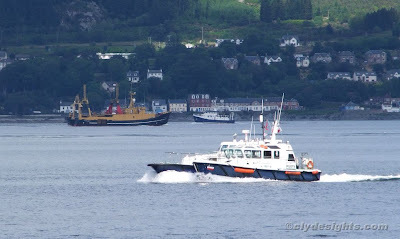 A busy view showing two of Clydeport's pilot cutters passing Skelmorlie. TOWARD, nearest, was towing MOUNT STUART from the Small Boat Harbour at the west end of the container terminal to Largs Marina, where she was to be lifted out of the water for maintenance. In the background, heading upfirth past Innellan is Serco Denholm's SD COLONEL TEMPLER, returning from her first sortie out of the Great Harbour for several months. Heading south is the Scottish Environmental Protection Agency's research vessel SIR JOHN MURRAY.